In Gandhiji’s own words Hind Swaraj ‘is a severe condemnation of modern civilization’.1 Gandhiji’s negative opinion about modern civilization extended to all its aspects. Modern technology, machine being the fundamental constituting unit of it; and Western social institutions, particularly those pertaining to law and medicine, came in for the most severe criticism. The purpose of this paper is to explore whether a unifying framework exists within which Gandhiji’s views regarding various aspects of modernity could be understood. At one level one might think of such an exercise as quite superfluous in view of the facts that on the one hand Gandhiji’s commitment to non-violence was of a very high order and on the other he saw embodiment of violence in every feature of modernity. If in the value-system of a person non-violence figures very high and his characterization of a particular social order or civilization is such that violence figures in it in a prominent way then the evaluative judgment of that social order or civilization being unacceptable follows immediately; without any recourse to analysis within a complex framework. The reason why the above simple and straightforward way of understanding Gandhian rejection of modernity will not do is that regardless of how committed a person might be to a particular value it is inconceivable that a person would not be subscribing to other values. Once there is a multiplicity of values, conflicts of values are almost inevitable. 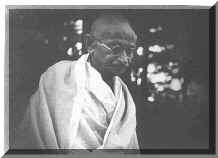 Gandhiji was not only committed to non-violence; he was also committed to truth and other important human values. When two values are in conflict, willingly or unwillingly, the individual must choose. What holds true for an individual holds for societies and civilizations as well. In Gandhiji’s perception Western or modern civilization might have been more violent than pre-British Indian civilization; but the question of Gandhiji thinking of Indian civilization prior to colonization as non-violent does not arise. it appears that Gandhiji’s intuitive understanding of what a civilization is mainly about was probably very close to identifying it with the meta-principle determining the domains and sub-domains of values. If we abstract from the other constitutive features of civilizations and concentrate only on the normative aspects then it is clear that statements regarding superiority or inferiority of a civilization in relation to another civilization are really statements proclaiming superiority or inferiority of the meta-principle embodied in the former civilization in relation to the meta-principle embodied in the latter. When a person belongs to or is a product of a particular civilization then it would be well-nigh impossible for him not to internalize the meta-principle embodied in that civilization. From the vantage point of the internalized meta-principle any civilization with a radically different meta-principle is bound to be found wanting. Europeans found all non-European civilizations fundamentally flawed. Although there were major non-Indian influences on Gandhiji, there can be little doubt that notwithstanding these influences the cultural-civilizational core of Gandhiji’s being was derived essentially from the meta-principle implicit in the Indian society of those days. Someone who had internalized the normative core of the Indian civilizational structure was bound to have the kind of judgment that Gandhiji had regarding the radically different modern civilization. Although the above way of looking at normative structure of societies does provide an understanding of Gandhiji’s critique of modernity, it also trivializes the critique. Given any two different civilizations any one of them would turn out to be superior to the other from its own vantage point. The meaningful comparisons are possible only when there are objective criteria in terms of which the meta-principles themselves could be evaluated. It is argued in what follows that in Gandhiji’s writings, particularly in Hind Swaraj, there are indications regarding the objective criteria which can be used for evaluating different social arrangements from normative perspective under certain conditions, although not in all instances; and that it is highly likely that while formulating his critique of modernity, Gandhiji had these objective criteria in mind, although in all probability only intuitively. One important question that one can ask regarding the normative structure of any society is whether it is sustainable.3 Not every value-system is self-sustainable. An example may help illustrate the point. In any society there will be different kinds of institutions performing a myriad of functions. Successful functioning of social institutions requires that individuals operating within the framework of these institutions perform their assigned roles. Consequently, it is very important that individuals internalize the idea of performing their assigned roles. In the absence of such internalization there would emerge a divergence between what is required of individuals for the proper functioning of the institution in question and what the individuals would actually do given their values and preferences. If judges decide cases not on the basis of law and evidence but in a way which would be most conducive to their self-interest then there is practically no possibility of the legal institutions performing as envisaged. Thus, while it would be foolhardy to expect that individuals will never behave in selfish ways, it is also clear that if the self-interest becomes the predominant motive for individual behaviour then in the long-run many institutions, where performing of assigned roles by individuals is crucial for their successful functioning, may become degenerate. Using a somewhat different phraseology, one can say that the social values which will be realized by societal institutions depend to a great extent on individual values. While one can expect that by and large justice will be upheld if judges on the whole decide cases on the basis of law and evidence; the values which will be realized through the legal system will have very little relationship with justice if in the main judges care more about their self-interest than about justice. The relationship between individual values and social values is not a one-way relationship. As the social values which are realized through the instrumentality of institutions to a great extent depend on individual values; so do individual values depend on what social values are. If certain social values are dominant in the society they are bound to have profound influence on the formation of individual values. As both individual and social values impact on each other the natural and important question arises whether there is any sustainable equilibrium of these values. Although the foregoing analysis provides some understanding of Gandhiji’s critique of modernity, it is in some important ways quite incomplete. Gandhiji’s anti-technology views, for instance, cannot be explained by the foregoing analysis. A priori there seems to be no reason why meta-normative considerations should have a bearing on one’s attitude towards technology. Although I have not been able to find anything in Hind Swaraj to substantiate it, it is probable that at an intuitive level Gandhiji perceived some kind of organic relationship between technology and values. For the purpose of linking Gandhiji’s views regarding technology with the meta-normative considerations it would suffice if it is accepted that given a particular technological structure not every value-system can be supported by it; and given a value-system not every technology can coexist with it. Given this kind of organic relationship between technology and values, one is bound to take an anti-modern technology stand if one comes to believe that the value-system that one would like to have in the society cannot co-exist with it. Civilization seeks to increase bodily comforts, and it fails miserably even in doing so. The only way that these statements could be reconciled is by invoking the idea of a meta-normative principle which will determine the domains and sub-domains of values; and by postulating that the Gandhian critique of modernity is not so much about the presence or absence of this or that value but pertains to the rejection of the meta-normative principle embodied in the modern civilization. To sum up: Gandhiji saw values interwoven in every feature of the society, whether it was technology, institutions or the consumption pattern. For Gandhiji, the normative structure of the society was of paramount importance. He was critical of everything which he thought might be inimical to the value-system which he believed in and considered superior to other value-systems. In all likelihood his opposition to modern technology stemmed from his intuitive feeling that the value-system that he believed in was not compatible with modern technology. His disapproval of most Western institutions also had its roots in his understanding that the nature of these institutions was such that they were bound to lead to a value-system which was inconsistent with the value system he found appropriate. His critique of modernity is non-trivial as implicit in it is the idea of non-sustainability of a social order which places hedonistic values on the highest pedestal. In according centrality to the normative structure of the society Gandhiji stands apart from his contemporaries who accorded centrality to science or science-based technology. Gandhi, Mohandas K., Indian Home Rule or Hind Swaraj, Navajivan Publishing House, Ahmedabad, 1938; Translation of ‘Hind Swaraj’, published in the Gujarat columns of Indian Opinion, 11th and 18th December, 1909; Published by Yann FORGET on 20th July 2003, with LATEX 2"; (Hereinafter referred to as HS); p. 15. One could also ask questions regarding other kinds of sustainability, ecological sustainability being one of the most important. If a society is ecologically unsustainable then it must necessarily be normatively unsustainable. The converse, however, need not hold. Similar entailment relations hold between normative sustainability and other kinds of sustainability. Thus the normative sustainability, the focus of discussion here, guarantees other kinds of sustainability. Speaking of modern civilization he says (HS, p. 29): Let us first consider what state of things is described by the word ‘civilization’. Its true test lies in the fact that people living in it make bodily welfare the object of life.